When Apple launched the iPhone 4 with an LED light, I was envious as that feature was lacking on my iPhone 3GS. Photographs on my iPhone 3GS were often dark and unsalvageable. That problem is no longer applicable thanks to a nifty LED device by Gadgets and Gear. The iFlash is a small (.75″ W x 1.75″ L) LED light that can be used for a flashlight or as a flash for the iDevices. It is compatible with the iPhone 3G, 3GS, 4, iPod Nano 3, 4, 5, iTouch 1, 2, 3, 4, and the iPad 1 and 2. The device does not require batteries as it derives its power from the iDevice. It did not drain my iPhone battery substantially. The iFlash contains a tiny, high efficiency capacitor to protect against a power overload. The iFlash is easy to use. Simply remove the cover and insert the 30 pin connector into the bottom of the iDevice. For such a small unit, the connection is snug and secure. Turn on the small switch located on the bottom of the iFlash and you are ready to take photographs or light your way in the dark. I found the light had a good range in both dim light and complete darkness. I was pleasantly surprised to find I could use the iFlash with my phone without having to remove the phone’s protective case. For iPhoneographers, the iFlash only allows an on/off function. It has no capability to sync a flash with the iDevice camera. Rather than avoid night photography with my iPhone 3GS, I found the light to be quite helpful in illuminating nighttime photographs. The iFlash also has a small black plastic jack attachment that fits into the headphone port for easy portability. I found this to be a little awkward as it bangs into the iPhone screen while in the headphone port. The iFlash currently is available in black, and white will be available soon. 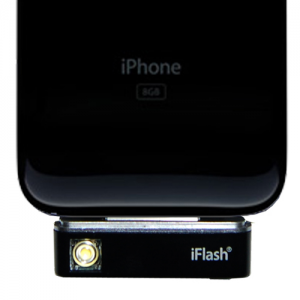 The iFlash LED light is a compact and effective solution for iDevices. A bit pricey for a simple light but it is less expensive than a new iPhone 4.